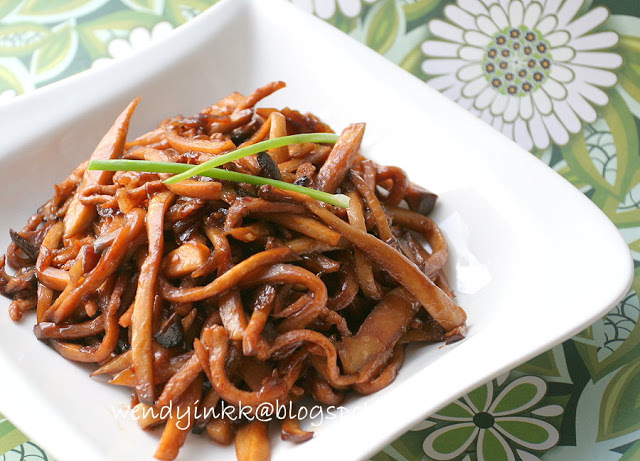 Medicinal mushrooms (MMs) have been used as natural medicines for millennia. Today, there are approximately 1.5 million species of fungi on Earth, and at least 300 species of mushrooms have been found to possess therapeutic properties1. These MMs have over 100 (!) medicinal functions, including antitumor, immunostimulating, antioxidant, antiviral, antibacterial, detoxification, hypoglycemic, and hepatoprotective activities. 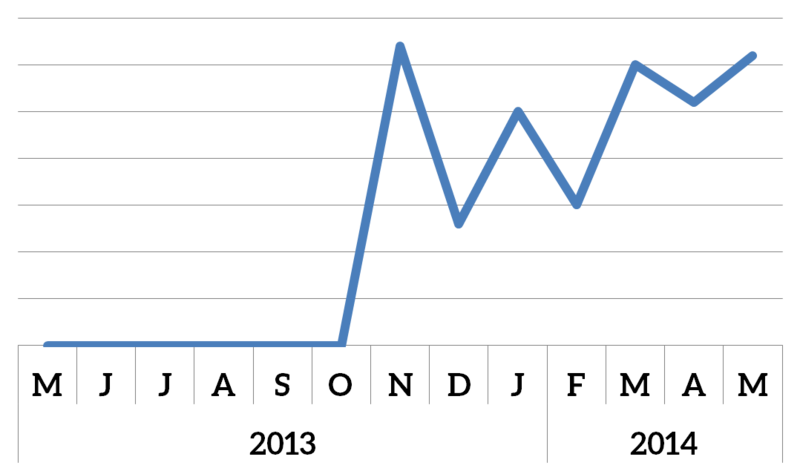 Despite their long history and numerous benefits, the scientific study of MMs is relatively new. MM scientists hope to discover and extract therapeutic compounds from MMs to eventually mass-produce and provide these ancient treatments in a more modern (and lucrative) capsule or tablet form (portmanteau-of-the-week: nutraceuticals). Muppet paw on a rug Mycelium grown on coffee grounds. From Wikipedia. 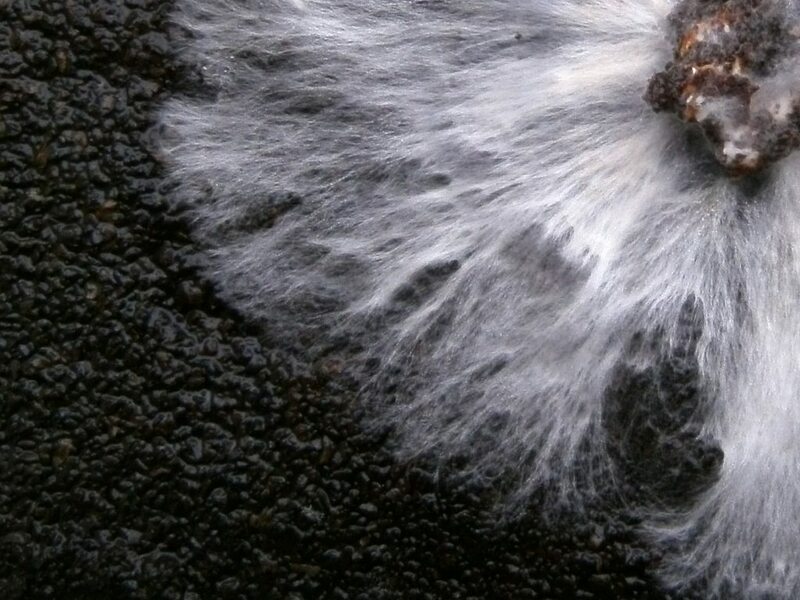 The bioactive compounds from MMs can be extracted from the fungi’s fruiting bodies (what you might put on your pizza), the mycelia (the long, stringy vegetative part of the fungus, pictured above), or from submerged culture (grown inside of a nutrient broth, which looks disgusting). 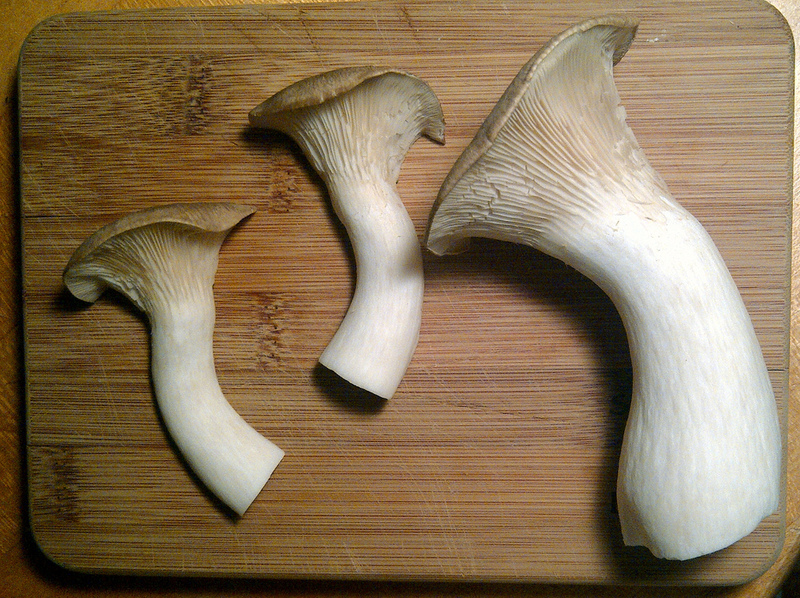 Today, I’d like to introduce you to the King Oyster mushroom, aka Pleurotus eryngii. King Oyster mushrooms not only make for a tasty bacon substitute (and otherwise delicious ingredient in a number of other recipes), they also have antioxidant, hepatoprotective, and antitumor properties2! As a bonus, an excreted polysaccharide (“EP”) from Pleurotus eyrngii has the ability to decrease the lipid content in foam cells 3. Though they sound like harmless bubbles, foam cells are actually kind of scary en masse. Foam cells sound like fun, but then they burst and form a “necrotic core” and lead to atherosclerosis…. 🙁 From Tabas, 2010. Foam cells are macrophages (immune cells that eat pathogens via phagocytosis) that have ingested fatty materials, such as oxidized low density lipoproteins (oxLDLs, “bad cholesterol”), which give them a foamy appearance. 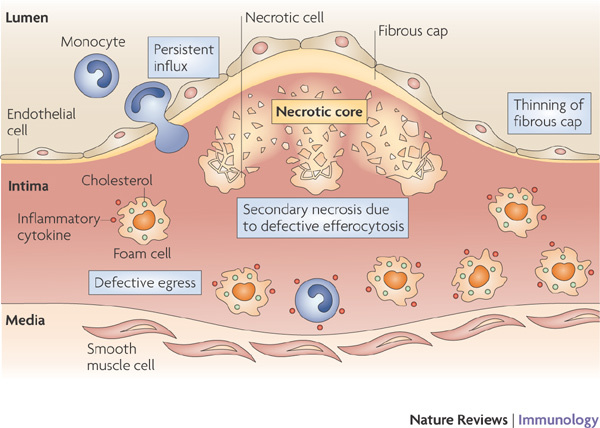 Over time, the foam cells can accumulate on blood vessel walls, where they grow and may eventually rupture, forming a “necrotic core.” The remnants of the foam cells and oxLDLs recruit white blood cells, which attract more macrophages, leading to “atherosclerosis”4 . When atherosclerosis occurs, the arteries harden and narrow. This may lead to heart attacks, strokes, and other cardiovascular diseases. Therefore, the inhibition of foam-cell formation by Pleurotus eyrngii may be useful for the prevention of cardiovascular diseases! But how does it work? The EP could decrease the lipid content of foam cells by: 1) decreasing the intake or 2) increasing the removal of oxLDL from the foam cells. Chen et al. (2014) recently reported that the former occurs via downregulation of our gene of the week: CD36! For shopping reference, these are some real King Oyster mushrooms. Yum! Image from Flickr’s tiny banquet committee. CD36 is a mysterious, multifunctional “class B scavenger receptor” with many ligands. CD36 activation can lead to many different processes, including taste5! The many ligands and physiological responses of CD36. From Cho & Febbraio (2014). Importantly, CD36 is an oxLDL receptor. 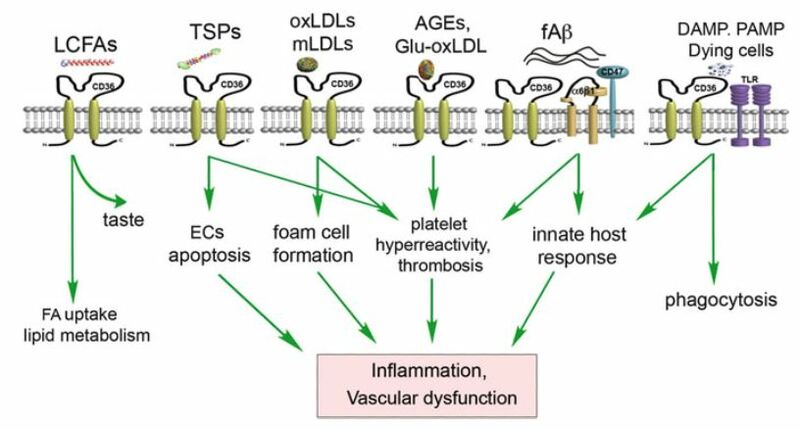 Mice without Cd36 on an atherosclerosis-prone background and fed a high-fat diet have less atherosclerotic lesion formation than mice on the same background and diet that express Cd3667, and CD36 has recently been endorsed as a therapeutic target for cardiovascular illnesses8. Chen et al. (2014) found that mRNA expression of CD36 is greatly increased in oxLDL exposed cells, but coadministration of oxLDLs with the isolated Pleurotus eyrngii EP suppresses this up-regulation! (The exact mechanism through which this occurs is still unknown). Conveniently, Chen et al. found that the EP can be obtained not only from the fruiting bodies of Pleurotus eyrngii but from (gross) submerged culture. This means that the EP can be readily mass-produced! But since this news has only recently be released, it will likely be a while before you see Pleurotus eyrngii dietary supplements in your local whole foods. So in the meantime, eat up! While Park (2014) and Cho & Febbraio (2014) were promoting CD36 as a therapeutic target, Chen et al. (2014) stumbled upon it as the target of the King Oyster mushroom. It’s been a good season for CD36 research!